The Alienware 13 is a mediocre showcase for a stunning OLED display. Gaming laptops have slimmed down in recent years, trimming back from 10-pound bricks to somewhat more manageable six to eight pound behemoths. Most are now reasonably backpackable, at least — but other laptops have also slimmed, and a gaming laptop is still intimidating to lug around. Alienware’s 13 R3, a gaming notebook with a 13-inch display, remains an almost unique solution. Razer’s Blade is its main competitor, with a 14-inch display and slim body. You can also find some models from lesser-known companies, like Aorus. And that’s about it. 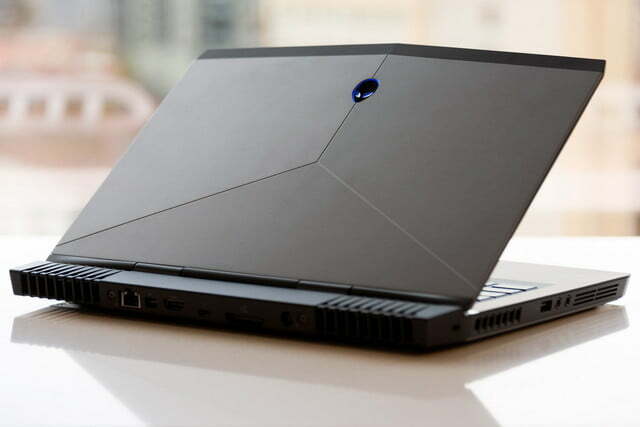 Despite its size, the Alienware 13 has serious hardware. 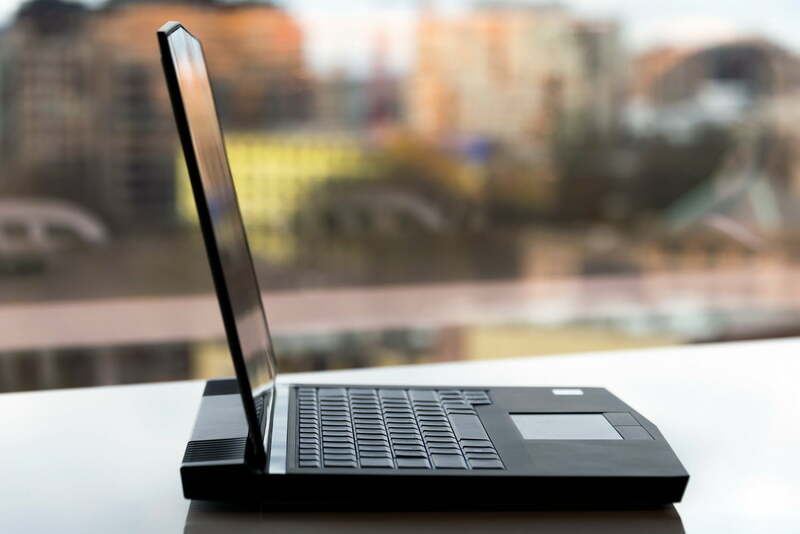 Every version has a quad-core processor, and our review unit had the Core i7-6700HQ, which is essentially the industry standard in 15-inch and 17-inch gaming notebooks. That’s paired with Nvidia GTX 1060 graphics, 16GB of RAM, and a 512GB solid state drive. It also arrived with the optional OLED display. This is the top-of-the-line model, and while the base version is sold at $1,200, this edition carries an intimidating $2,100 price tag. That’s a lot for a small gaming laptop, as an Acer Predator 15 or AVADirect Avant can be purchased with a GTX 1070 for around $1,700. So, does the Alienware 13 live up to the promise of truly portable PC gaming? There was a time when Alienware seemed the flashiest of gaming brands, but in recent years, it has felt more subdued next to the black-and-red or silver-and-bronze color schemes adopted by competitors. That remains true here. 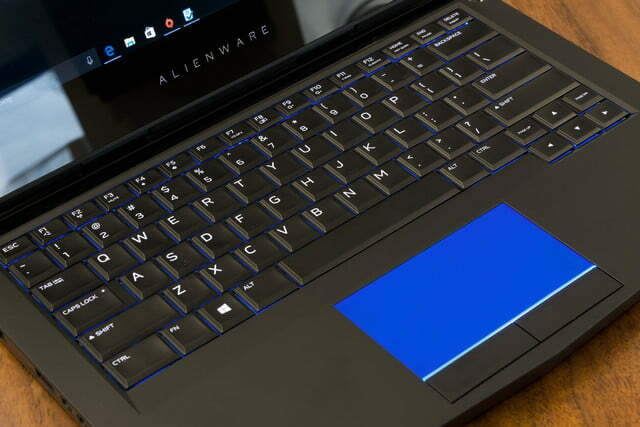 The Alienware 13 is only available clad in silver and black, while the default color of the glowing Alienware logo is a subdued blue. Make of that what you will. There’s something to be said for simplicity, and we tend to like that at Digital Trends. If you want something with more explicit gaming intent, don’t count out Asus or Acer. 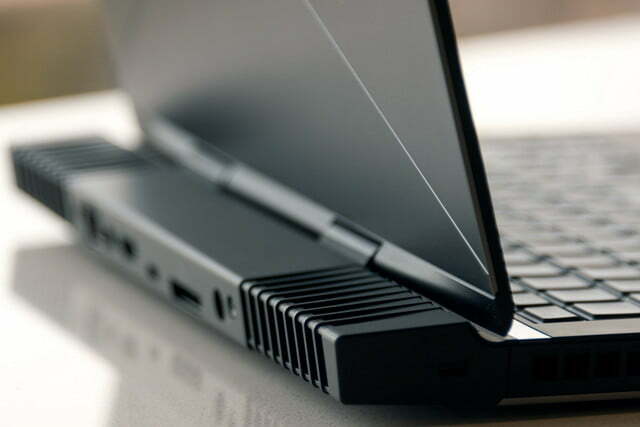 Though this is a 13-inch system, Alienware hasn’t learned how to bend the laws of physics. A quad-core processor and GTX 1060 demand room to house and cool, and this laptop is larger than you might expect. It’s .92 inches thick, which makes it two-tenths of an inch thicker than the latest Razer Blade, and its overall footprint is larger, too. Which goes to show you can’t judge the size of a laptop by the size of its screen. Though it has a smaller display than the Blade, the Alienware 13 is larger by every dimension. Anyone buying a 13-inch laptop probably wants it to be small. 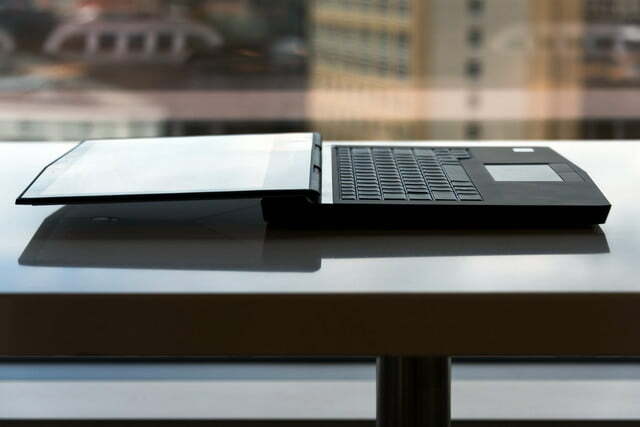 While certainly easier to carry than a 15-incher, Alienware’s smallest laptop is far from svelte. It feels solid, at least. While some gaming laptops still creak under their own weight, the plastic-and-metal Alienware is forged with precision. Panel gaps are exceedingly tight and flex is difficult to find. We’re also a fan of the hinge, which swings back a full 180 degrees. It’s not a feature you’ll use often, but it helps get the screen angle just right, no matter where you’re gaming. 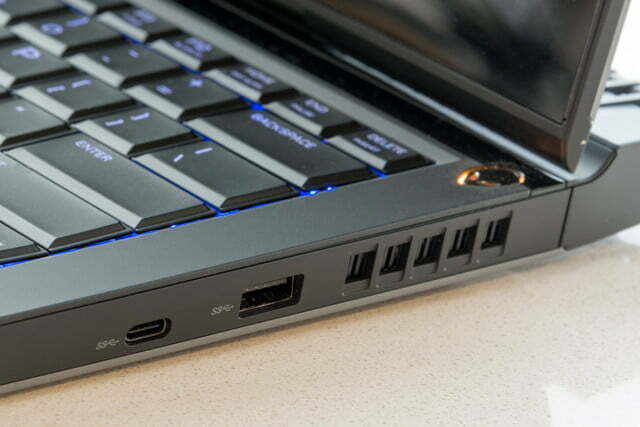 The Alienware 13 puts its girth to use with a wide selection of ports. It has two USB 3.0 Type-A ports, one USB 3.0 Type-C port, one Thunderbolt 3 port, HDMI 2.0-out, DisplayPort 1.2-out, Ethernet, and headphone and audio-out ports, either of which can also support microphone input. Finally, there’s an Alienware Graphics Amplifier Port, so you can connect an external graphics card if you feel so inclined. This array of options easily defeats other 13-inch laptops. In fact, there are so many options that they may seem confusing. But we certainly prefer to see ports than not, and we’re especially happy to see Ethernet included, as wired internet is more reliable than Wi-Fi when gaming online. Alienware is among the last bastions of old-school “beveled” key design. The key caps are in fact a kind of hybrid. Square, yet also possessing a distinct border that recesses into the chassis. Depressing a key reveals long travel with a soft, somewhat vague bottoming action. This is the only OLED screen available on a gaming laptop. In other words, it feels like keyboards did five years ago. Some will love it, and others won’t, but we doubt anyone will hate it – for typing, at least. We’re less sold on the keyboard’s gaming merits. The vague feel can lead to uncertainty in hectic moments. Below the keyboard is a touchpad that, like the keyboard, feels old-school. It’s small for the size of the laptop, at four inches wide and a hair more than two inches deep. Multi-touch gestures work, but feel cramped. 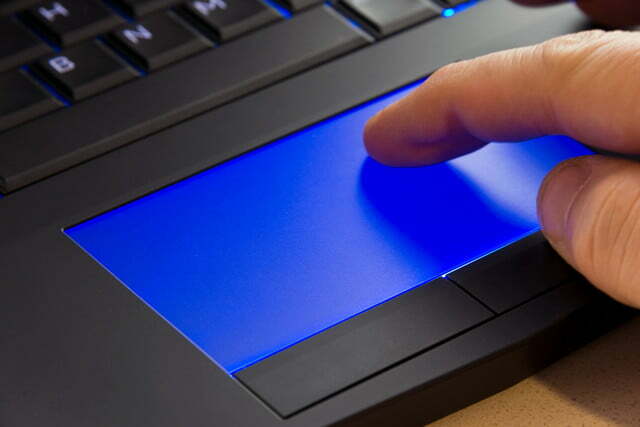 Some of what could be the touchpad surface is taken up by two large, tactile mouse keys. Here, too, Alienware seems to be catering to an old-school audience. The buttons feel great, but the space they consume could’ve allowed for a better touchpad. The real problem, though, is the touchpad’s sensitivity. It doesn’t feel responsive when asked to handle multi-touch gestures. A swipe down requires a moment or two before the computer responds. You’re better off using the optional touchscreen. Both the keyboard and touchpad benefit from backlighting. The lighting is uneven in both cases, which detracts from the laptop’s otherwise premium look. 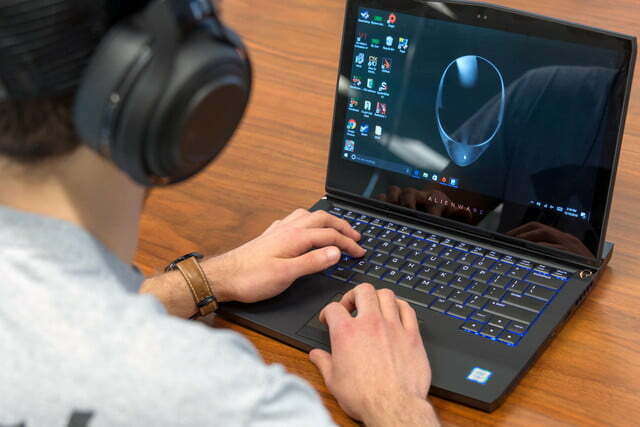 The keyboard lighting can be adjusted in four zones, and the Alienware logo, power button, and touchpad can also be changed, in case you’d like your laptop to look like a carnival ride. Most Alienware 13 laptops leave the factory with a 1080p display, but our review unit came with a 1440p OLED touchscreen. It’s a rare panel to see in a modern laptop, and it remains the only OLED available on a gaming laptop. In testing, the screen offered all the benefits you’d expect. 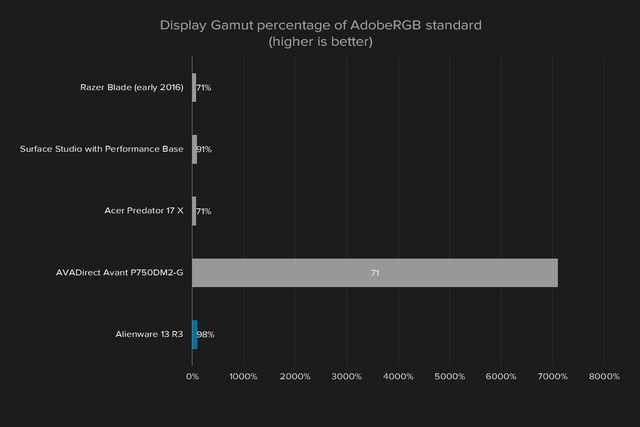 Its color gamut is massive, hitting 100 percent of sRGB and 98 percent of AdobeRGB. We’ve only seen competitive results from other OLED displays, and from the Asus Zenbook UX500, which used Quantum Dots. Colors are accurate, as well, and grayscale reproduction is excellent for a laptop. At times, we did notice an over-saturated appearance, but the issue did not show up as much as with other wide-gamut displays we’ve seen. But contrast is the real star of the show. We recorded a maximum ratio of over 300,000:1. By comparison, the best backlit LED displays, like that on the MacBook Pro 13 with Touch Bar, struggle to exceed a ratio of 1200:1. The benefit is most obvious when playing a dark game, like Diablo 3, in a dimmed room. The screen reaches such a deep shade of black that, at times, it’s hard to tell where bezel ends and the display begins. And don’t discount pixel density. The 2,560 x 1,440 display, packed into a 13-inch screen, translates to 220 pixels per inch. 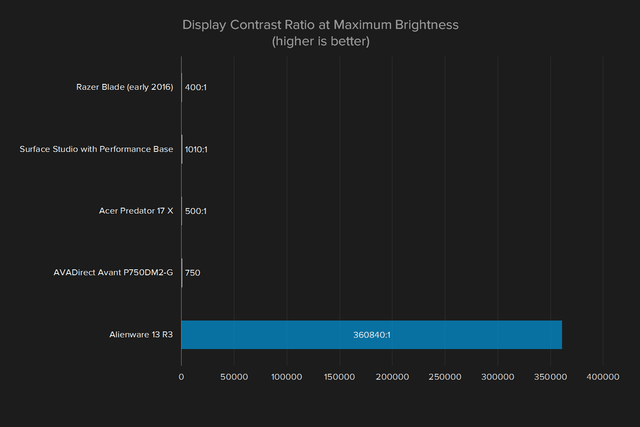 That’s Retina-level clarity. Games look razer-sharp, with clear, crisp transitions between dark and bright objects. OLED isn’t perfect, however. The display suffers a blue cast when viewed from off angles, and that can disrupt the otherwise accurate colors. Thankfully, the viewing angle is forgiving enough that you likely won’t encounter it during normal use. But it may be a problem if you and a few friends are huddling around the Alienware 13 to watch a movie. Our tests were also able to induce image retention with ease, a problem that impacts OLED displays in various products. Just a few minutes with a checkboard was enough to make it visible. However, changing to any bright screen immediately erased the retention, so this probably isn’t a long-term issue. That aside, the OLED screen is perfect for gaming. It even has a benefit that picky PC gamers will love; no ghosting. While retention can occur from objects that stay static for a short while, moving objects display no retention. 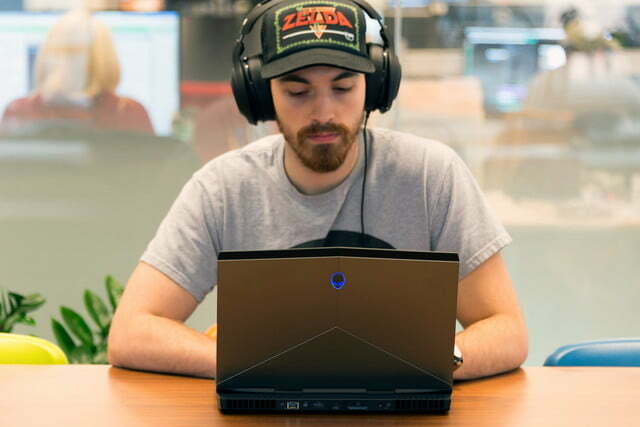 Even when viewed in slow-motion, playback of gameplay on the Alienware 13 revealed zero banding, trails, or ghosting behind moving objects. We don’t think it’s a stretch to say this laptop’s OLED is perfect for games, no matter the genre you prefer. 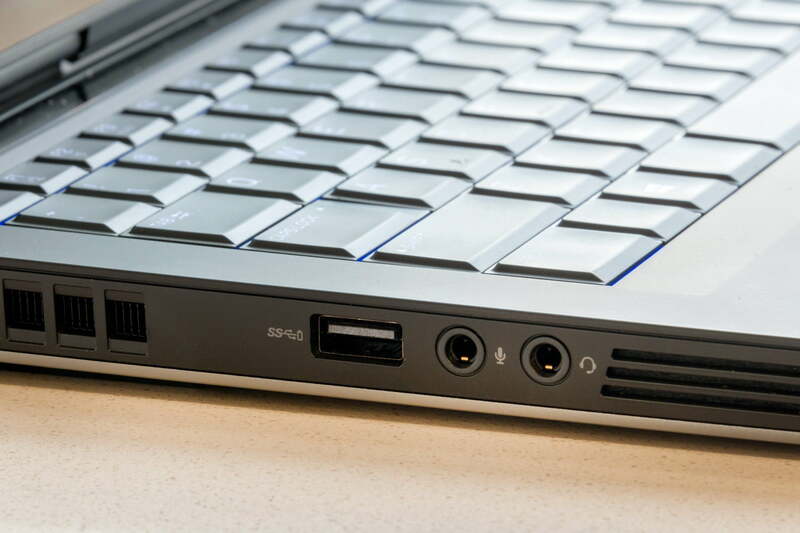 Though small, the Alienware 13 has big sound. Its speakers produce impressive volume at maximum, and provide good sound staging, which makes it seem the speakers are somehow hidden behind the screen. Bass is a bit lacking, though, and that hurts the overall presentation of games, dulling them with tinny, muddled sound. Still, the speakers are fine if you happen to forget your headphones, and they’re good for a laptop of this size. The Core i7-6700HQ processor in our Alienware 13 review unit is not the base chip, but every version has a quad-core. The most affordable models opt for one of the new Core i5 quad-core chips, instead. This led to solid, if predictable, performance. If you were expecting a surprise, sorry. The Core i7-6700HQ is a known quantity. 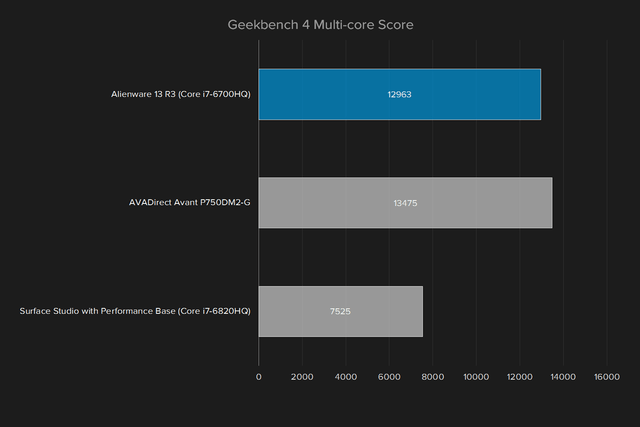 In single-core tests, it performs as well or better than Core i7 dual-core processors. 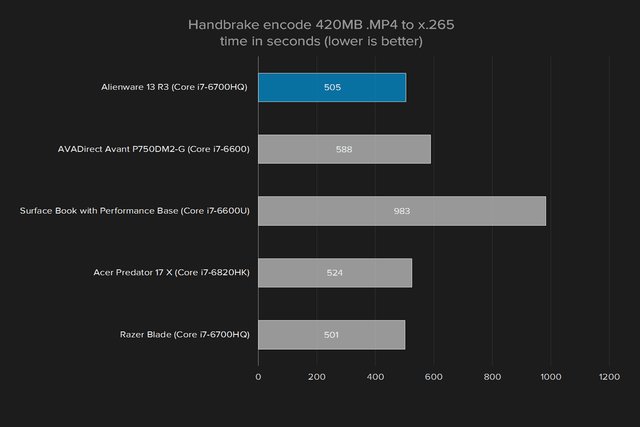 In quad-core tests, it almost doubles what the fastest dual-core chip can do. Yes, this processor is common for a reason. It’s a great fit for gaming. The solid single-core Geekbench results mean the Alienware 13 will perform well in games that are not optimized for a quad-core. And if a game is optimized, the Alienware can flex its muscles. Our review model came with a 512GB solid state drive, more specifically, the Toshiba 2280. You don’t hear Toshiba’s name often in the storage space, because it mostly sells directly to hardware manufacturers. But its drives perform well. While the Alienware 13 doesn’t set records, it has nothing to be ashamed of. In fact, it can be proud of its balanced read/write performance. 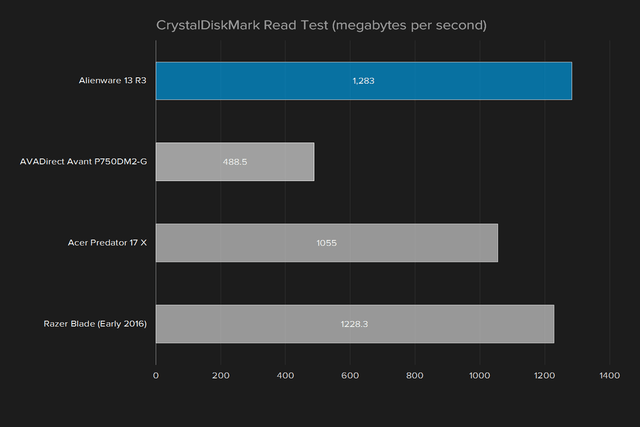 As you can see in the graph, competitors like the Razer Blade tend to have drives which offer excellent read speeds, but achieve it through sacrificing write performance. 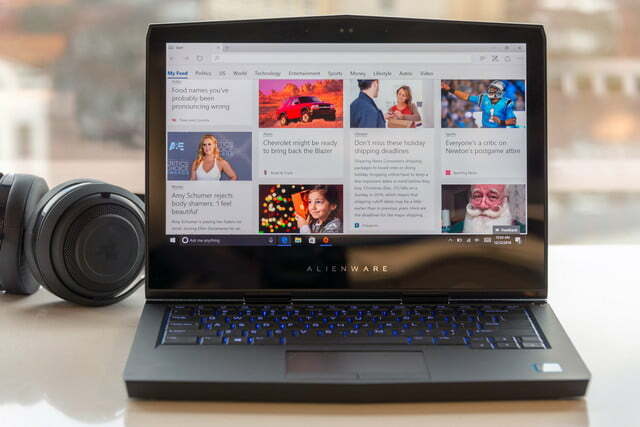 The Alienware still leans more heavily on reads than writes, but not as heavily as its peers. Gamers will find nothing to complain about in real-world use. The SSD loads titles with incredible speed. Not every title benefits, but those that do load with surprisingly quickly. Even Civilization VI, a game notorious for its long initial load time, felt relatively snappy. Since it’s a gaming laptop, the Alienware 13 will succeed or fail based on how well it plays game. There’s reason to think it might be overmatched. The 1440p OLED display on our review unit looks beautiful, but its pixel density tests the limits of the GTX 1060 graphics chip. 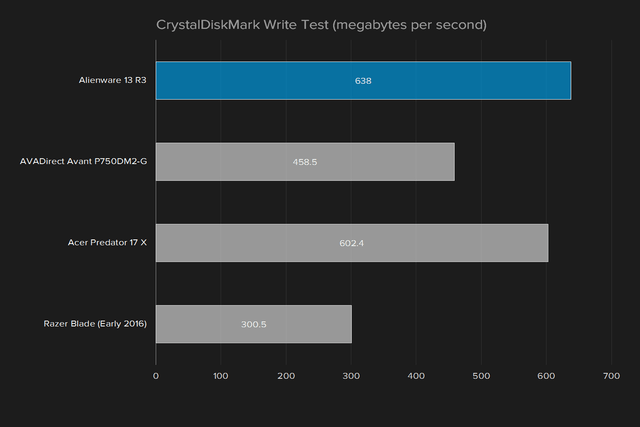 At first glance, the result of 9,573 may not look great, as it doesn’t beat other laptops we’ve tested recently. Yet it’s worth some perspective. The GTX 1060 can’t be expected to defeat a GTX 1070, and the Alienware 13’s score is far better than what we saw from the GTX 960M. 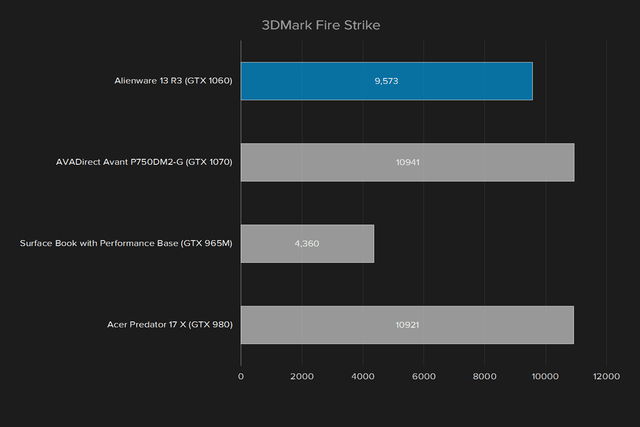 In fact, the Fire Strike score is only 12 percent slower than the desktop GTX 1060 video card. We also tested the Alienware 13 in several games. Because we’re updating our test suite, we don’t have as many past benchmark results to use for reference. That said, we found the laptop struggles when asked to game at 1440p and maximum detail. In Civilization VI, the Alienware 13 averaged 48 frames per second at 1440p and Ultra detail. Test results didn’t vary at lower detail and resolution settings, though we didn’t try anything below 1080p. That suggests the processor may be the bottleneck in this game. You can’t judge the size of a laptop by the size of its screen. Deus Ex: Mankind Divided fared worse. At 1440p and Ultra detail it averaged just 24.9 frames per second, which most PC gamers will consider borderline unplayable. Reducing detail to high increased the average framerate to 35, which is at least acceptable. Those who demand smooth gameplay will want to roll back the settings to 1080p and High detail, at which point the game manages 47 FPS. Note, too, that we turned off the game’s extremely demanding multi-sampled anti-aliasing feature, which is notorious for sapping system performance. Gamers can find some solace in Battlefield 1. It ran at an average of 58 frames per second with resolution set to 1440p and detail set to Ultra. While the minimum framerate dipped to 41, we thought overall performance was plenty smooth for most gamers. If not, turning detail down to Medium increases the framerate to an average of 74 FPS. Overall, the Alienware 13’s performance is solid, but shows the latest games aren’t pulling their punches. All three of the titles tested failed to achieve 60 FPS at any combination of settings we tried, when played at the laptop’s native 1440p resolution. You’re going to need to turn down a few details if you want to play the latest and greatest. Dell has put the Alienware 13’s size to use by stuffing in a 76 watt-hour battery, one of the largest units that we’ve recently come across in a 13-inch laptop category. We’d typically expect to see a 50 or 60 watt-hour unit. Despite its size, the battery is outmatched by the Alienware 13’s performance. The hardware in our review unit is similar to most entry-level 15-inch gaming laptops, and drains the battery just as quickly. 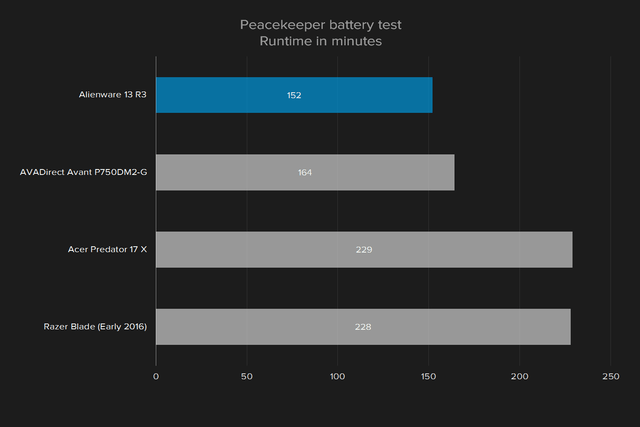 The Peacekeeper web browser benchmark, a heavy load, drained a full charge in just two hours and 32 minutes. That’s not a great result. 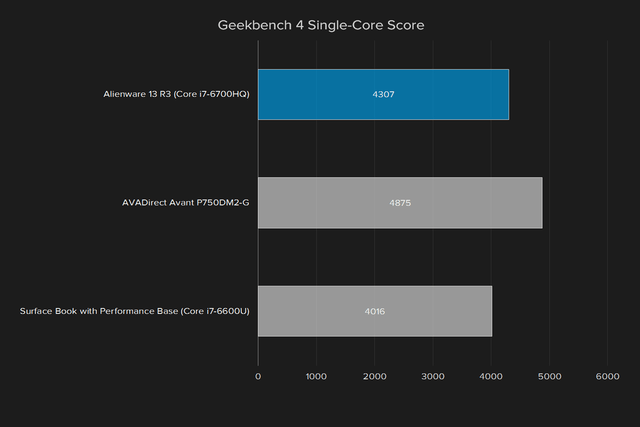 The AVADirect Avant P750DM2-G barely beat that, hitting two hours and 44 minutes. The Razer Blade easily exceeded it by lasting three hours and 48 minutes. 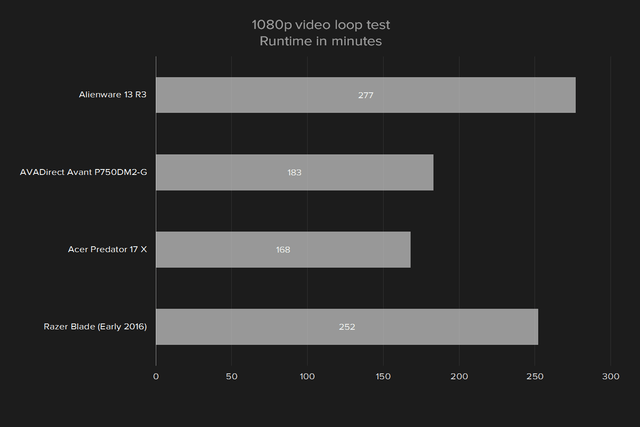 We received better results from our video loop test, which repeats a 1080p trailer of The Avengers. 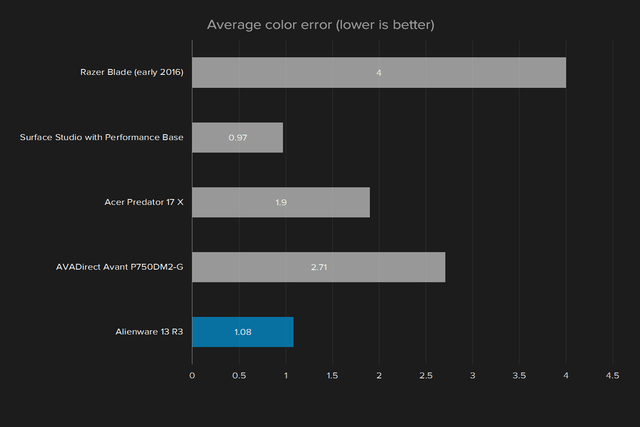 In that test the Alienware managed four hours and 27 minutes, a major improvement over its Peacekeeper result. That number is also better than the Razer Blade, which hit four hours and 12 minutes. However, we last tested the Razer Blade with GTX 970M graphics. It is now available with the same GTX 1060 found in the Alienware 13, and may perform better than in our last test. Overall, these numbers are disappointing. You might expect the Alienware 13 to serve as a more portable alternative to larger gaming laptops, and it is certainly lighter. But, depending on use, it may not last longer on a charge. You’ll still need to find a power outlet after a few hours, even if you’re browsing the web instead of playing games. These applications stay out of the way, but provide useful features when you need them. Otherwise, we only once saw a registration application, which was banished with a “never show this again” checkbox. The Alienware 13 comes with a standard one-year warranty. Acer recently grabbed the lead in warranty terms by offering a two-year standard warranty on most of its gaming laptops, but few have tried to emulate this. The one-year warranty, though short, remains industry standard. 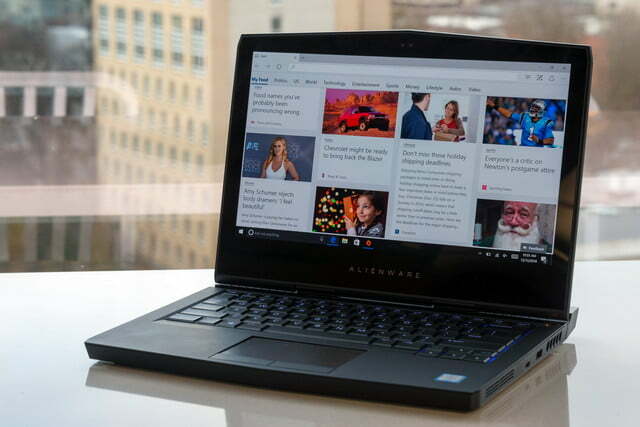 Though recently revised, the Alienware 13 already feels like an old laptop. Razer has set the standard by which small gaming laptops are judged with its Blade series, and the Alienware 13 doesn’t keep up. Our OLED-equipped review unit’s price tag of $2,200 is an issue, too. That’s a lot for a laptop with a GTX 1060, and while we love the screen, we’re not sure it’s worth the $250 surcharge over the base 1080p display. The GTX 1060 struggles to power the OLED option’s enhanced 1440p resolution. The main competitor is Razer’s Blade. We gave that laptop a Recommended award when we last tested it, and it has since received an update to Nvidia GTX 1060 graphics, alongside new display options. 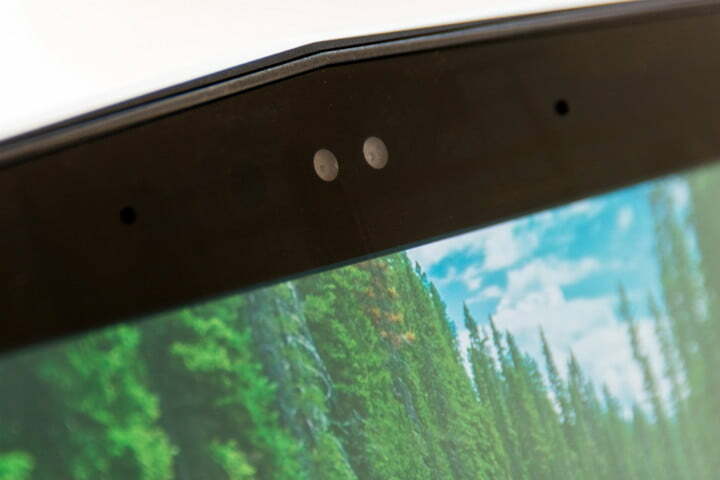 The Blade is thinner, with a larger display. However, the Blade doesn’t offer an entry-level model to compete with the Alienware 13. While our review unit’s price was extremely high, the Alienware actually starts at $1,200. That’s $600 less than the Blade, which starts at $1,800. We prefer the Blade, but not everyone will be able to afford it. The GTX 1060 graphics chip in the Alienware 13 is cutting-edge, but also far from the most powerful version of modern Nvidia graphics. There’s not a lot of headroom for future games. Most gamers will be looking for an upgrade within three years. You might think that makes the base, $1,200 version a great buy. But we’re not so sure. It does come with a GTX 1060, but it also has a 180GB solid state drive and display resolution of just 1,366 x 768. Frankly, Alienware shouldn’t be selling a gaming laptop with such a low resolution screen in 2016. We love the OLED display. It’s beautiful, and makes perfect sense for a gaming laptop. It’s just a shame it’s not available alongside more attractive hardware.